Suicide is a major issue and it's increasing – In England it is a sad fact that every 2 hours a person dies by their own hand. 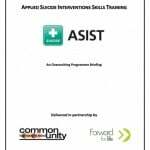 ASIST suicide prevention training is one way of supporting communities to be suicide safer. In 2016, almost 6,000 suicides were registered in the UK. Although adults in middle- and late-middle age have the highest suicide rate, suicide occurs in people of all ages, including children and when someone takes their own life, the effect on the family, friends, the local community and the wider community is devastating – An immeasurable impact. If you want more information about our ManMade Programmes, our licensed and tailored suicide prevention training or any area you feel we may be able to help you with, then the please feel free to Get In Touch.